The Club is dedicated to community improvement through volunteer service. and thank you for your interest in the GFWC Viera Woman's Club, Inc. If you are a woman residing within Suntree, Viera or Rockledge, FL, you are eligible for membership in this organization dedicated to charitable, educational and civic activities in our community. We are a non-profit 501(c)3 organization. Our affiliate is the General Federation of Women's Clubs (GFWC), founded in 1889 and headquartered in Washington, DC. Members volunteer in their own communities to support the arts, preserve natural resources, advance education, promote healthy lifestyles, encourage civic involvement and work toward peace and understanding. 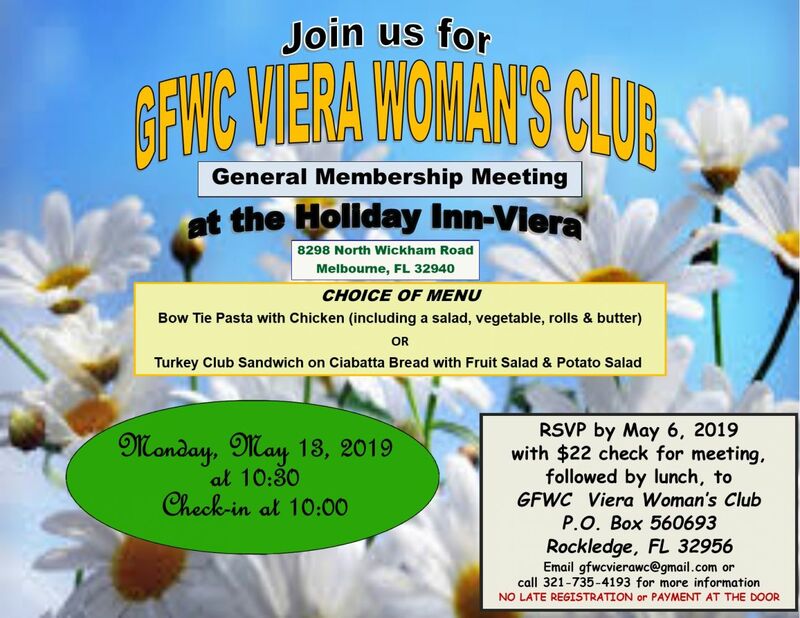 The GFWC Viera Woman's Club was formed in 2004 and currently has approximately 110 members. Our clubwomen are true volunteers in action -- to date, at the end of our 14th year, we have volunteered 199,120 hours and sent $457,690.00 in goods and monetary donations to local, national and international charitable organizations. No late registration or payment at the door, PLEASE. Email gfwcvierawc@gmail.com for more information.